, known by the title of the Apostle of the North American Indians, from having been the first that preached the gospel among them, was a native of England, and born about the year 1604. He was educated at Cambridge, and engaged himself as an assistant to a school, which, Neal says, he was not permitted to continue, on account of his puritanical notions; but for this we have no other authority. It appears, however, that he was a nonconformist in matters of church-government, and that in 1631, in order to enjoy his own opinions uncontrouled, he embarked for America, and succeeded a Mr. Wilson as pastor of an independent church at Boston. 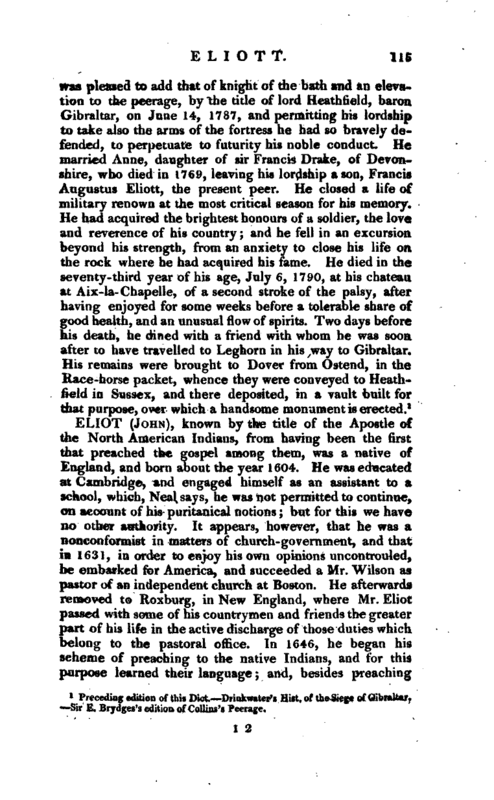 He afterward^ removed to Roxburg, in New England, where Mr. Eliot passed with some of his countrymen and friends the greater part of his life in the active discharge of those duties which belong to the pastoral office. In 1646, he began his scheme of preaching to the native Indians, and for this purpose learned their language; and, besides preaching | among them with considerable success, and at much hazard, he translated the Bible into the Indian language: this was printed at Cambridge, in New England, in 1664, and a short time before Mr. Eliot’s death, it was reprinted with corrections by Mr. Cotton, his fellow-labourer in the Indian mission. By the exertions and influence of this excellent man, many of the wandering Indian tribes were collected into regular societies, and formed into congregations, which were instructed by him, and by others who joined him, in the manner best adapted to their capacities. 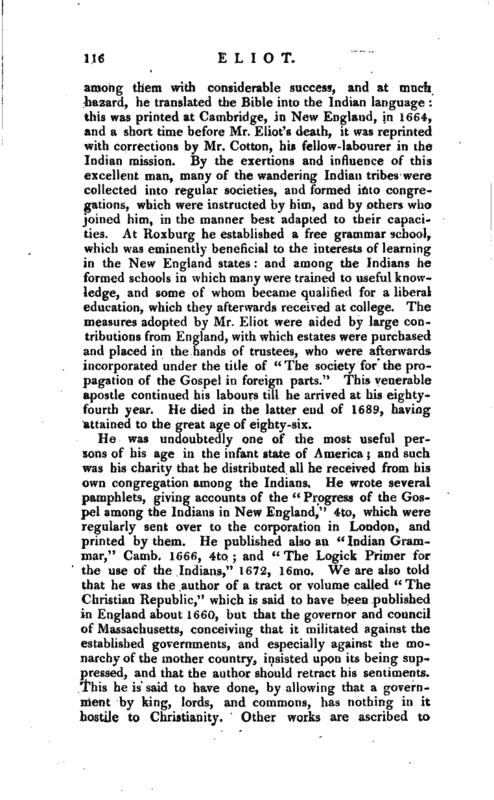 At Roxburg he established a free grammar school, which was eminently beneficial to the interests of learning in the New England states: and among the Indians he formed schools in which many were trained to useful knowledge, and some of whom became qualified for a liberal education, which they afterwards received at college. The measures adopted by Mr. Eliot were aided by large contributions from England, with which estates were purchased and placed in the hands of trustees, who were afterwards incorporated under the title of “The society for the propagation of the Gospel in foreign parts.” This venerable apostle continued his labours till he arrived at his eightyfourth year. He died in the latter end of 1689, having attained to the great age of eighty-six. Life of Eliot, by Cotton Mather, 12mo, and in Mather’s Eccles, Hist, of New England. 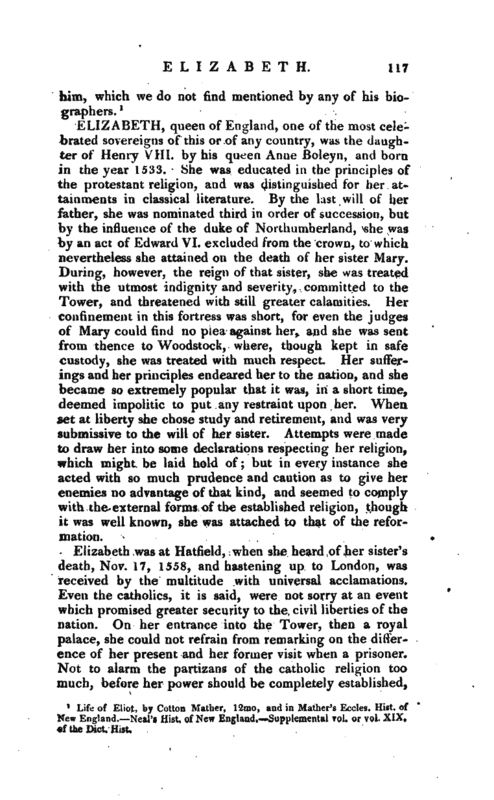 Neal’s Hist, of New England. Supplemental yol. or vol. XIX. of the —Dict. Hist.